Aaron Doran Cogan (44)	 None. United’s season declined further after a 1-0 defeat away to Inverness. It was a game in which United deserved absolutely nothing, only mustering one shot on target in the 90 minutes. In fact, only an excellent goalkeeping performance from Harry Lewis prevented a more resounding victory. 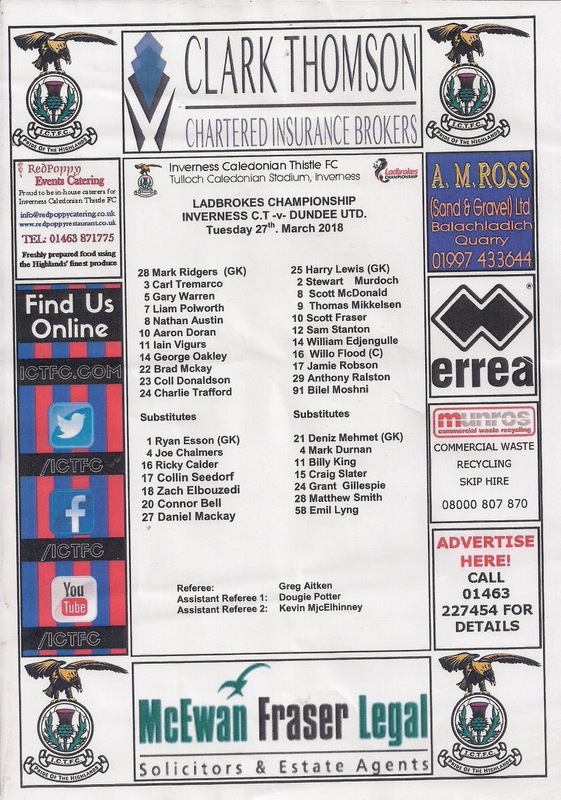 Csaba Laszlo made two changes from the team which drew 1-1 with Dunfermline, with Matty Smith being dropped to the bench and Tam Scobbie dropping out due to injury. They were replaced by William Edjenguele and Thomas Mikkelsen. 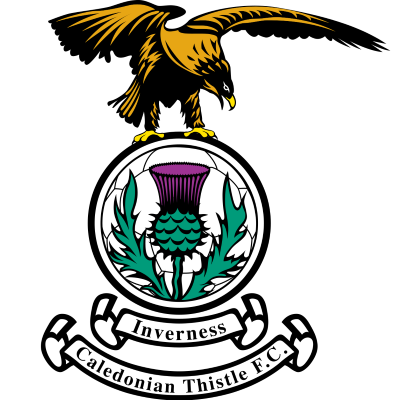 Inverness came into the game high on confidence after their Irn Bru Cup victory over Dumbarton, although despite good recent form were not entirely safe from the relegation play-off spot, with Brechin City’s relegation having been finally confirmed the previous weekend. It was the away side who was the first to threaten after six minutes of the game as Tony Ralston found himself in space at the back post but the Celtic loanee was unable to control the ball, which went out for a goal kick. Less than a minute later, Scott McDonald had a shot from over 20 yards out which Inverness goalkeeper Mark Ridgers saved easily. Inverness had their first chance after ten minutes as they worked themselves into a promising position in the United box, but the final pass was too strong and Harry Lewis was able to gather the ball. In truth, it was a rather uneventful start, which was largely attributable to the horrible conditions in Inverness. The strong wind was making it difficult for both sides to create very much, and neither side was able to keep possession for any length of time. A chance finally came on the 17th minute for the home side when Nathan Austin had a header from around the penalty spot saved by Lewis after the striker met a long free kick from former United player Coll Donaldson. 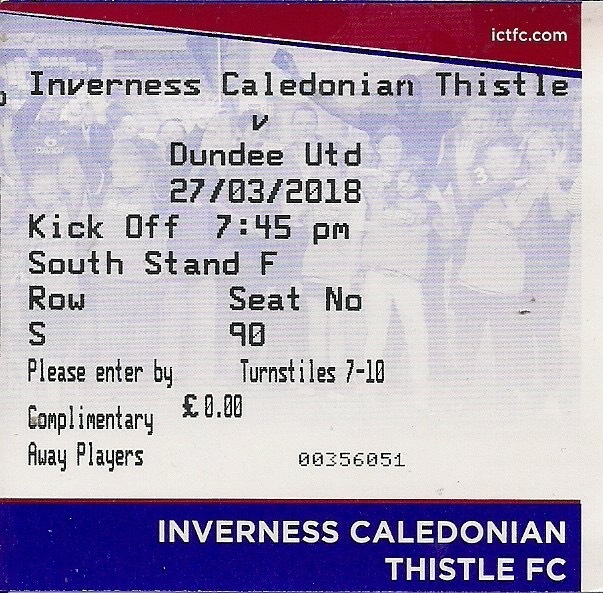 In the 23rd minute Inverness had another chance, and it was a chance which really should have been taken by George Oakley, who had also missed good chances in the recent game between the sides at Tannadice. A cross from Austin found the striker in acres of space inside the penalty area, but despite having time to pick his spot he could only watch in horror as his header flew over the bar. It was a massive let-off for United. The home side then forced a series of corners as they put the pressure on, but they were unable to convert any of them. Oakley then had another attempt on goal on the half hour mark. He was able to get his effort on target on this occasion, but his low shot was easily saved by Lewis. Inverness forced another corner on the 35th minute through a Bilel Mohsni clearance after United gave the ball away in midfield, but again it came to nothing. The former Rangers defender was on the receiving end of a bad challenge from Iain Vigurs five minutes from half time, although a free kick was the only punishment the referee meted out despite the tackle causing an angry reaction from the Tunisian. United could consider themselves fortunate not to be behind despite there not being a huge number of chances in the game, and they did fall behind a minute before half time. It came after United had actually worked themselves into a good position at the other end, but it was spoiled by Jamie Robson overhitting a cross from the left-hand side. From that resultant goal kick, George Oakley hit a pass which split open the United defence and the onrushing Aaron Doran was able to slot the ball past the exposed Harry Lewis, who was slightly unlucky not to keep the ball out. It meant that this was the eighth consecutive game in which Dundee United had lost the first goal, and saw them facing a deficit at the half time break. Matty Smith replaced Thomas Mikkelsen at the start of the second half. However, the first chance of the half fell to the home side. Four minutes into the half, Nathan Austin was played in by Liam Polworth, however the striker was forced wide and he failed to get his shot from a narrow angle on target. The game carried on in much the same way as the first half with chances at a premium, enlivened only by a booking for Scott McDonald for dissent seven minutes into the half after a free kick was awarded against him. Emil Lyng was brought on for Scott Fraser on the hour mark in an attempt to rescue the game. Another chance fell the way of the home side a few minutes later when youngster Daniel Mackay was played in on goal by Aaron Doran, but the 16-year-old saw his shot well saved by Harry Lewis. The resultant corner looked threatening but luckily for United no Inverness player was able to get the finishing touch which would have put the game beyond the away side. The young striker made a less auspicious contribution soon afterwards with a poor challenge on Jamie Robson, which led to the Inverness player being booked. It was arguable that he was fortunate not to be sent off for the challenge, which led to the United left back needing lengthy treatment on an ankle injury. Mackay was continuing to cause trouble for United in the more traditional sense, and after he took on three United players at the edge of the box the ball found its way to Charlie Trafford, who saw his low shot saved by Lewis, who was certainly having a busy evening. Then, out of the blue with fifteen minutes to go, United spurned a wonderful opportunity to draw level with what was their first clear cut chance of the game. The ball found its way to an unmarked Scott McDonald in the centre of the Inverness penalty box, and despite him having time to take a touch and compose himself he chose to take on the shot first time on the volley. However, the Australian striker got under the ball and he sent his effort wildly over the bar. Daniel Mackay had yet another shot almost immediately afterwards after being played in by George Oakley who had won the ball in midfield, but again Harry Lewis was able to prevent him from scoring. With ten minutes to go United wasted another good chance as the ball bounced around in the Inverness penalty area, with several players being unable to get the ball under control and get a shot away before Sam Stanton blazed the ball over the bar. That was Stanton’s last contribution to the game as he saw himself replaced by former Inverness player Billy King. The changes had no impact on the game, and Inverness were able to see the game out. In the final minute Emil Lyng could only head wide after a looping cross from Willo Flood. It was a tough chance, but it was as good as it got. A Scott McDonald cross was gathered easily by Ridgers in stoppage time, and that was that. The 1-0 defeat was another setback in United’s bid to secure a play off place, and if anything, the scoreline should have been more emphatic in the home side’s favour.